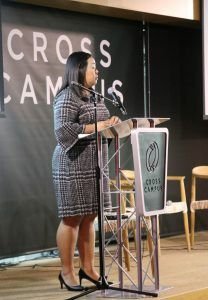 On January 25th, LAEDC hosted our latest R.E.D Talk, at Cross Campus South Bay, where entrepreneurs and innovators discussed the challenges of cultivating a diverse and inclusive but also productive workforce. Here are some of the biggest takeaways and what you missed. An expert panel discusses their workforce solutions and strategies while also fielding questions from the audience. 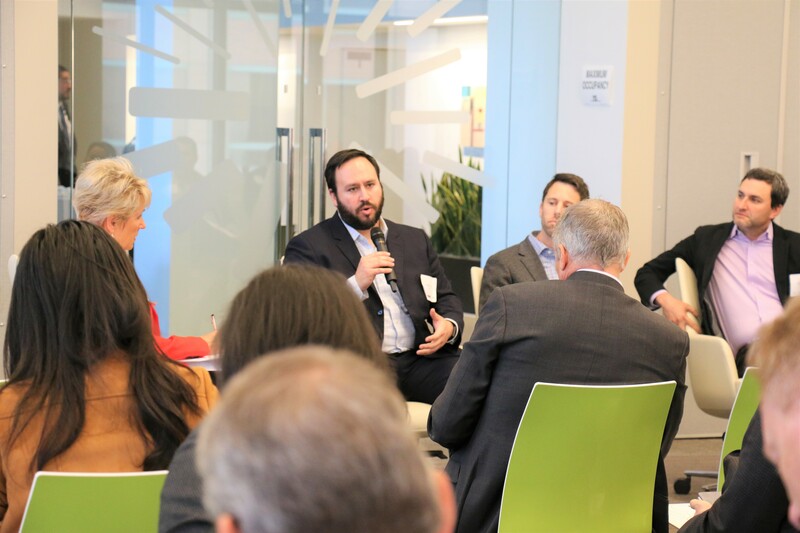 How Can We Accelerate the Talent Pipeline? One exciting topic discussed by Jessica Ku Kim, Director of Workforce Development at the LAEDC, was the concept of “regional industry alignment” which is the concept of intermediaries like workforce development boards and the LAEDC assisting businesses, colleges and universities in the many layers of the development process. An unbiased third-party can help quell some of the challenges faced by those on both the supply and demand side of workforce development. 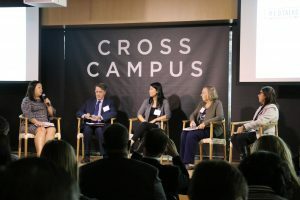 In a continuing series of industry deep-dive reports, the Center for a Competitive Workforce (CCW) recently released Professional Services in the Los Angeles Basin, which forecasts that by 2021 there will be just under 400,000 payroll jobs in professional services in the LA Basin (LA and Orange Counties combined), resulting from the nearly 14,000 new jobs created from the baseline year of 2016. Nearly half of projected total job openings –over 6,300 – will be in middle-skill occupations that generally pay well and are accessible with less than a bachelor’s degree. Shannon Sedgwick, a co-author of the 2018 Professional Services Report, provided an overview of findings, click here to download the report! We all want a more diverse workforce…but how? 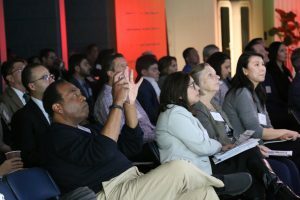 Audience members take in presentations from industry experts. 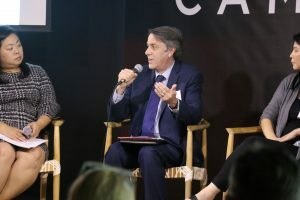 A major theme for the day’s conversation was sharing best practices from large companies like California Water to continue to create new pathways for underprivileged students and the uniquely abled populations to realize their full potential. 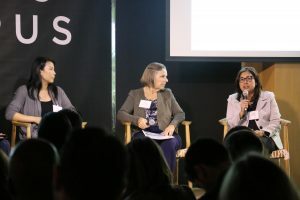 Absorbing barriers for individuals is the collective responsibility of the entire talent ecosystem but organizations like the South Bay Workforce Board focus specifically on making the process for employment easier to navigate for even those facing significant challenges. 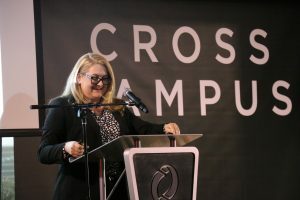 Due to their close relationship with companies, and the “enormous amount of time we put into getting to know each individual employer,” according to their Regional Affairs Manager, Chris Cagle, the South Bay Workforce Investment Board has been able to create programs which have literally taken people from living without a home to a position with $100,000 salary. The South Bay Workforce Investment Board (SBWIB) utilizes apprenticeship and pre-apprenticeship program like their Aero-Flex and Bio-Flex bring together manufacturers in the region, through their involvement in the program we have been able to create a curriculum that is flexible and tailored to the needs of employers. Jan Swinton, Dean of Workforce Development, Glendale Community College and Judith Velasco, Director at Verdugo Workforce Development Board showcased some of the amazing work they have accomplished in Glendale, California. Together they have collaborated on the Uniquely Abled Academy which allows those with disabilities the opportunity to enroll in a 16-week course where their days are split between training in a classroom setting and receiving hands-on experience through site visits or on-the-job-training. “We understand that people with disabilities have multiple skill sets and multiple interests,” said Velasco. “So what we are trying to do with this model is to expand career opportunities and link those opportunities directly to employers.” While charting a new career course can be difficult enough, the challenges become amplified for those with any sort of disability or disadvantage. All in attendance were inspired by the commitment of these two to making the process better, one individual at a time if that’s what it takes.